"When the Girls came out to Play"
Rosie Hendon aged 15 and Mary Toovey wearing Jackets and Jeans on a bombsite in Southam Street, North Kensington, West London. Young working-class women, often from Irish immigrant families, they had settled in the poorer districts of London - Walthamstow, Poplar, North Kensington. Behind the camera was Ken Russell, then just another photography student, who later went on to become one of Britain's most famous film directors, making over 80 films, including Women in Love, and Tommy. Vera Harrison, aged 19, a recent migrant from Ireland. She worked in the kitchens at St Bartholomew's Hospital. Four years after this session, Russell gave up still photography to concentrate on getting into the film industry. "As soon as I'd saved up enough money, I made amateur movies, which is what I wanted to do in the first place. I showed them to the BBC and got taken on as the arts-programme monitor. That was the beginning of the end!" His pictures, which have only recently been rediscovered, are the only known professional photographs of the teddy girls. Without these images, they might well have been forgotten. 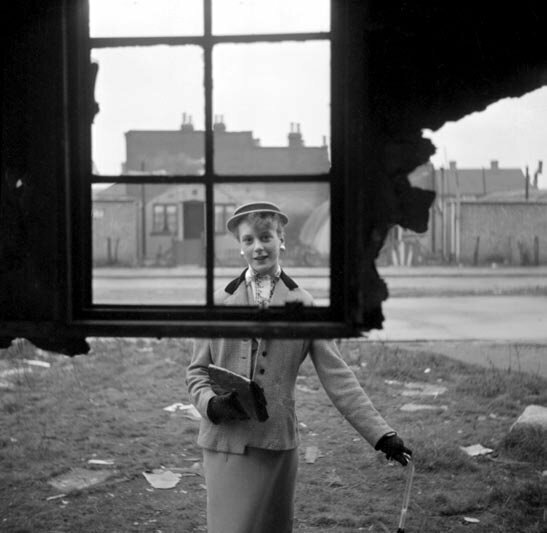 18 year old Barbara wood of Paistow models her boater and embroidered blouse through a paneless window in a bomb-shattered East London building in January 1955. Ken Russell's work offers a glimpse into the lives of a group of feisty women who were set on creating an identity of their own. 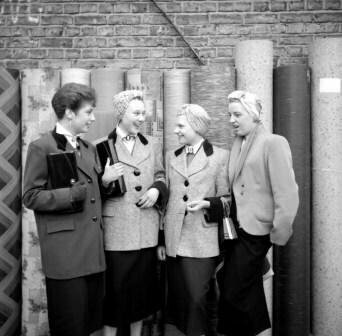 Their choice of clothes wasn't only for aesthetic effect: these girls were collectively rejecting post-war austerity. 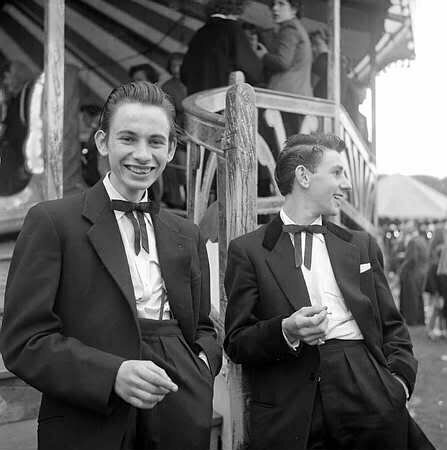 Teddy Boys at the Fairground off the Lea Bridge Road, Leyton, London in January 1955. Among many people, male "teds" had an intimidating reputation. They were often linked in the public's mind with violent crime. In July 1953, 17-year-old John Beckley was murdered by Teddy Boys near Clapham Common, and the Daily Mirror's headline - Flick Knives, Dance Music and Edwardian Suits - made an explicit connection between clothing and criminality. Former teddies insist that the connection between thuggery and style only applied to a small number of them. "We weren't bad girls," says Rose Shine, then Rose Hendon, who was 15 when she posed for Russell. "We were all right. We got slung out of the picture house for jiving up the aisles once, but we never broke the law. We weren't drinkers. We'd go to milk bars, have a peach melba and nod to the music, but you weren't allowed to dance. It was just showing off: 'Look at us!' We called the police 'the bluebottles' - you'd see them come round in a Black Maria to catch people playing dice on the corner. But we'd just sit on each other's doorsteps and play music." Rose Price aged 18 and a shop assistant from Tottenham talking to friends who are protecting newly done hair in headscarves. 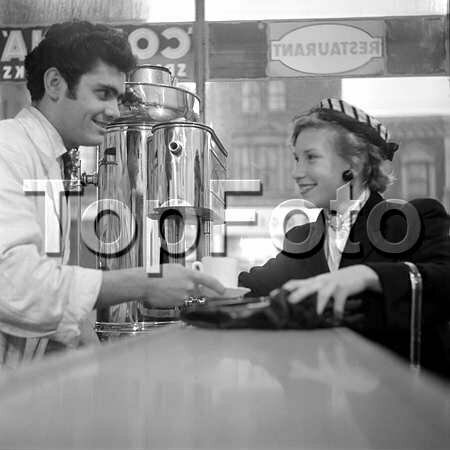 This turban style was popular with Teddy Girls in the mid fifties. The teddy girls left school at 14 or 15, worked in factories or offices, and spent their free time buying or making their trademark clothes - pencil skirts, rolled-up jeans, flat shoes, tailored jackets with velvet collars, coolie hats and long, elegant clutch bags. It was head-turning, fastidious dressing, taken from the fashion houses of the time, which had launched haute-couture clothing lines recalling the Edwardian era. Soon the fashion had leapt across the class barrier, and young working-class men and women in London picked up the trend. 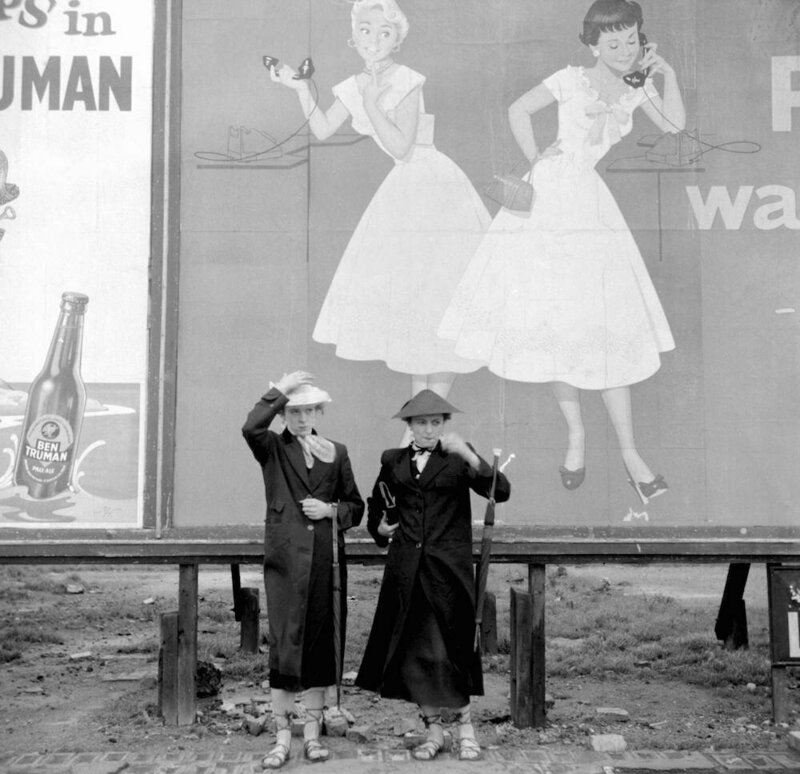 Only a few of Russell's pictures of the teddy girls were published at the time - in Picture Post. 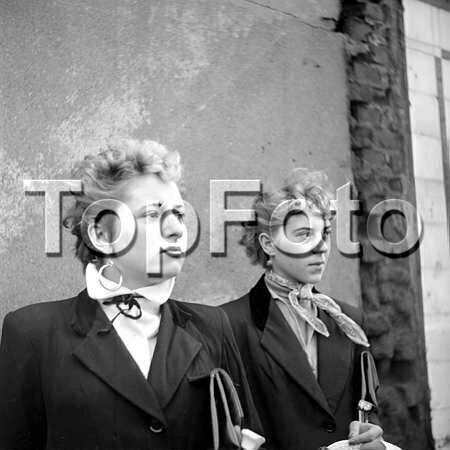 The rest of them lay unseen until their discovery in 2003 by Judy Westacott, something of a teddy girl herself, who, after months of searching, tracked them down to a photographic archive in Edenbridge, Kent. "I used to pore over the Picture Post article, but to find the rest of the shoot was incredible. They were in a filing cabinet. I don't think people had pulled them out in a long, long time. Then we approached Ken Russell, and he was absolutely over the moon; he had handed them to his agent in 1955 and he hadn't seen them since. He thought they had been lost for ever." 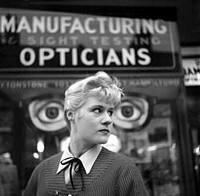 17 year old Josie Buchan, a Teddy Girl and a fashion student who attended the South West Essex Technical College & School of Art with Ken Russell's future wife, Shirley where he also attended as a student in 1955. In 1955, Russell was a fashion student at Southwest Essex Technical College and School of Art on Forest Road in Walthamstow. "I knew someone in the fashion department who had this friend who dressed in strange clothes," he remembers. "She told me she was a teddy girl, and I realised that she was a sort of feminine version of a teddy boy." His friend introduced him to other girls she knew, and Russell took pictures of them "hanging around on Saturday afternoons in Walthamstow Market, a rather bombed-out sort of area back then, and round where I lived in Notting Hill Gate". A rare photograph of the Southwest Essex Technical College and School of Art on Forest Road in Walthamstow taken in the 1940's where Ken Russell studied his art of Photography. 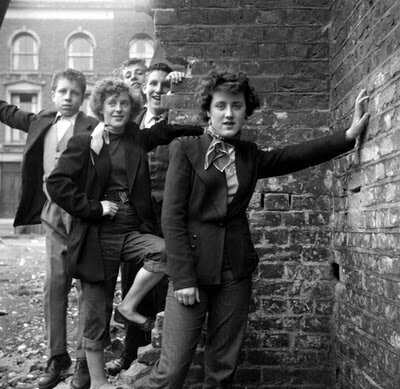 The Teddy Girls didn't care that their outfits shocked their families, as long as they were noticed among their peers. "We got dressed up because it was always the teddy boys who got the look-in. We weren't being noticed by them," says Shine. She is now a 66-year-old grandmother and proud to have been one of the first teddy girls. "It was our fashion that we made up." Elsie Hendon 15, and Rose Hendon 15, with Mary Toovey and Jean Rayner 14, in front of the "Seven Feathers Club" in Edenham Street, North Kensington, January 1955. Rosie Shine appears in several of Russell's pictures with her twin sister, Elsie, and two friends who lived near her in Southam Street, northwest London. She laughs, remembering Ken Russell's photo shoot: "He was just another photographer. He took photos of us and that was the last we knew of it. We didn't know he was going to do anything with them. We thought it was a laugh. We stood there with our hands on our hips. We felt proud: someone was taking a photo of us." Rose and her group of West End teddy girls would meet at the Seven Feathers Club in Edenham Street, North Kensington, a youth club popular with both the boys and the girls. "There was a jukebox and dancing," she says. "Just tea and cakes, because we didn't go to pubs then. It wasn't until we were 20 that we might go to the pub. We weren't bad, not like some of the boys. There was this song called Rip It Up… Well, the boys, they used to go and rip up the seats"
Grace Living, aged 17 from Plaistow, in an East End Coffee Shop. 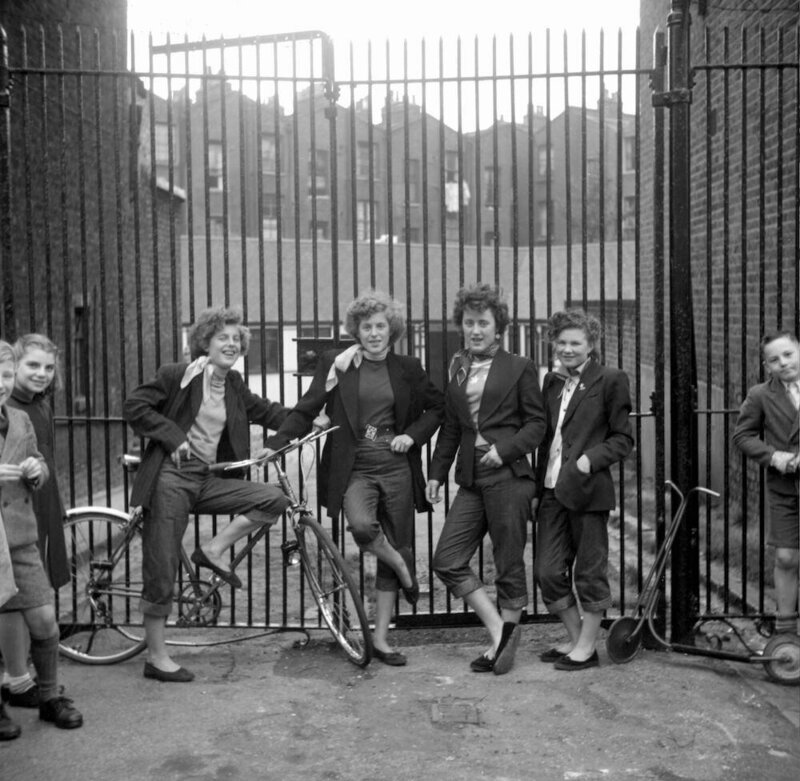 Teddy girls from different parts of London rarely mingled. Grace Curtis (then Grace Living) was one of the girls Russell photographed in the East End. "We hung out down the Docklands Settlement - a club where there was space for dancing and boxing. We were East End. In those days you just stuck to your area. There was a little snack bar in the club where you could buy drinks and we just all got together and danced." Both women hoot with excitement when they remember dancing The Creep by Ken Mackintosh - a slow shuffle of a dance so popular with teddy boys that it led to their other nickname of "creepers". "It's the best dance," says Curtis. "You used to dance or jive with your girlfriends, but for The Creep you could choose your partner. You could pick up a fella and go and dance with him." 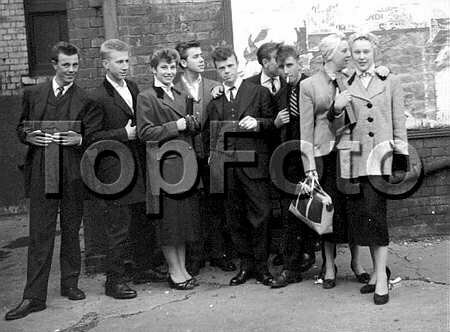 A group photograph of Teddy Boys and Teddy Girls. Girls in future generations took up the teddy-girl trend, even when most people thought it had disappeared: there is a ted scene still in existence. Westacott, who became a teddy girl in 1978 when she was 13, explains: "It married two things I really liked - the 1950s music and the style of dress. It was exciting going out in tight skirts, looking elegant - it was very stylish compared to flares. My parents hoped it might be a passing phase but it lasted 25 years." She was determined "for other people to see these amazing pictures" and to correct a few common misconceptions: "The public perception is that teddy girls all wore circle skirts and bobby socks and listened to Rock around the Clock, and that kind of stuff. But these pictures predate it, and it proves that the cult wasn't really music-based at the start, that was something that came later. What the teddy boys and girls were listening to was big-band stuff like Ted Heath and Ken Mackintosh." January 1955 Pat Wiles and Iris Thornton, two 17 year old Teddy Girls from Plaistow. Teds from the past and present, fashion students, - people who lived in the East End during the war years and the 1950s, photography and Ken Russell fans, all came to see the long-lost photographs when Westacott and Joe Cushley, a music journalist, put them on show at East London's Spitz gallery last year. After another long search, Westacott managed to find Mary Toovey and Rose Shine, who feature in the pictures, and invited them to the exhibition. Shine was keen to arrive wearing her whole teddy-girl get-up: "One of my friends wouldn't dress up like me, but I said, 'I'm not afraid to. I'm still proud!'" Russell and the teddy girls enjoyed meeting each other again. "They were as unrecognisable as I was, but we remembered the good old days," says Russell. Westacott describes meeting the original teddy girls as "mind-blowing". "They were pretty feisty, independent women at 16, and now they're nearly 70 they are still very strong and very sure of their own identity. It's easy for us now to choose different styles of dress and mix and match our clothes - but at that time, 50 years ago, you were really seen as a complete outsider." 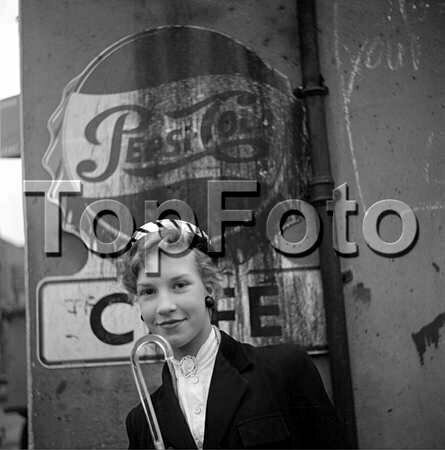 Grace Living, 17 years of age from Plaistow poses with a perspex handled umbrella outside East London Cafe in January 1955. 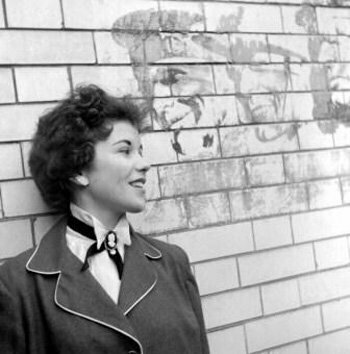 Postwar London - interview with a 1950's Teddy Girl from the East End of London.